You know what time it is, because you read the title to this article and it was sufficiently descriptive. Also, this has become a bit of a tradition and you’re likely wondering what I’m going to like out of this set for 75% decks. Every set I try to find things with 75% deck applications and not write a generic “Which cards are good in Commander” article, so you may see some choices you don’t agree with. If you really want to be a Bone Picker, write in the comments section and we’ll hash it out like adults. If I miss something obvious, write it there, too. Otherwise, we don’t need a ton of preamble, here. This is pretty straightforward and hopefully as much fun to read as it was to write. Let’s do this! Angel of Sanctions — Angels are always useful, and being able to cheat them into play with tribal spells or Kaalia makes this a pretty useful tool. It’s not replacing Admonition Angel or Angel of Serenity in most of my decks, but it’s a useful tool and it removes creatures from the game, which I hear is useful. This has a place in decks for sure. And just like that, I’ve started the article off strong when I typed my first entry and the voice in my head said “Wow, Mythic Angels are good? Tell us more, professor!” Look, I can’t help that Angel starts with A. I’ll get to some cards you might not have considered in 75% decks in a minute, I promise. 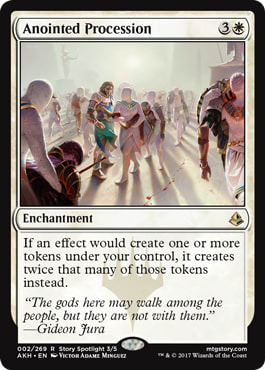 Anointed Procession — I’m more excited for a functional reprint of Parallel Lives than normal because not only do I know this will be like $0.50 on CoolStuffinc.com for like a year before it approaches (not reaches, I bet) the $7 Parallel Lives is going for but also because White could use this effect. I’ve long wanted Parallel Lives in my decks with Assemble the Legion, for example. I can’t tell you if this card is any good outside of 75% decks, though, that’s not really my area of expertise you guys! HAHAHAHAHAHA seriously I didn’t pick the names for these cards, sometimes easy ones start with A.
Anointer Priest — There is a non-zero chance you want another Soul Warden, and one that’s harder to make stay dead. 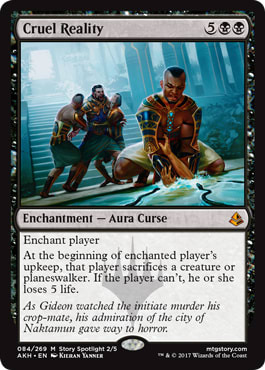 I personally like Suture Priest a lot more because it hoses their strategy, also, so this could end up getting cut a lot more than it gets played, but I like Embalm a lot, especially when they could make you discard this against your will. 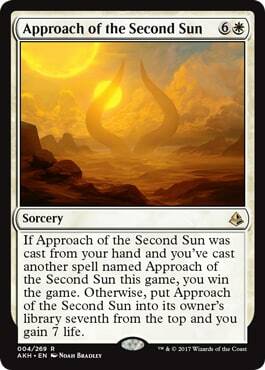 Approach of the Second Sun — I take notice of any and all cards that say “You win the game” and it’s pretty trivial to find ways to draw this right away or something equally cheesy. I love effects like this in 75% decks because it’s a fun way to win, it’s sufficiently difficult that you won’t do it often and you suddenly win games you’re losing badly meaning you have a shot against a tougher deck. Archfiend of Ifnir — This card alone made me get so excited about cycling that I wrote a whole article about it. It was a fun deck to build and this is going to continue to be a good card in decks like that. It even accidentally gets you value with wheel effects which are prevalent in Commander right now with Leovold (well, were in Leovold’s case) and Nekusar, the Mindrazer running around. This seems techy. As Foretold — Free is good, proliferate is good, try them together. 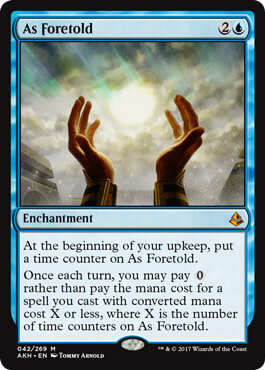 I think this card will be expensive with everyone trying to cast free Ancestral Visions and Hypergenesis in Modern, but if those don’t pan out, this could be a cheap pickup that does some work in EDH, growing along with your turns and eventually letting you cast a lot of free spells. 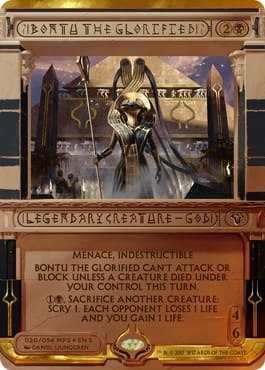 Bontu the Glorified — This is a god and gods get played, whether it’s at the helm of a deck or in the 99. I think Bontu is especially playable as she’s a sac outlet and Blood Artist in one. You know, kinda. I think this card will see play and I love sac outlets a lot. 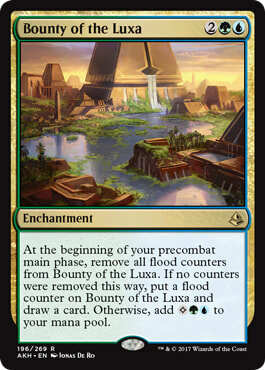 Bounty of the Luxa — I want this card to be good but I don’t know if it will get there. This card did help me come across a very silly deck that was a lot of fun to write about, though, so if that’s all it ever does, I’m OK with it. By Force — Is this better or worse than Shattering Spree, Shatterstorm, Release the Gremlins, and myriad other similar spells? I don’t know. I like this, though. Also, why don’t I ever see anyone running Viashino Heretic? That card seems really good, especially in Chandler decks. Canyon Slough — I think these are useful. I play the mono-colored cycling lands already so these will see play. I wish we had a one for my The Gitrog Monster deck, though. Cascading Cataracts — Yesss. I love another Crystal Quarry. Since this card needs little explanation for why I’d like it in 5 color decks, I’ll use the rest of this space to talk about the Mono-Black deck with Crystal Quarry, Composite Golem and Last Stand that used to dome people for like 14 with Last Stand. It was a bad deck, but I recently found it in a box of forgotten decks from High School and there are four Cabal Coffers in it, so I’m accidentally good at investing. Cast Out — I could see this getting play. 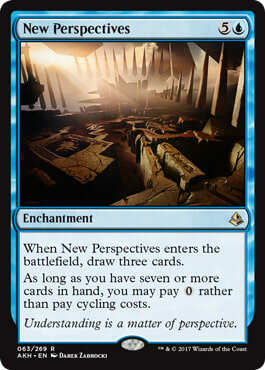 I think cycling versions of playable cards get the nod in Commander because the extra colorless mana tacked on is usually a non-factor in a longer, slower game. Also, this is Instant Speed and that’s useful. 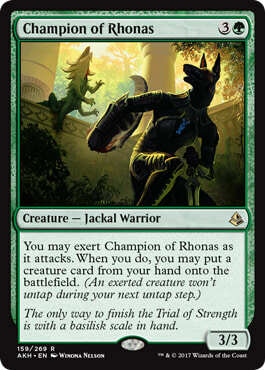 Champion of Rhonas — I really like this. It’s a suicide Elvish Piper some games, but I play a lot of decks like Maelstrom Wanderer where this would shine. It’s also going to be like a buck, so if you want a second Elvish Piper, maybe consider this before you consider Norwood Priestess. Channeler Initiate — I think this may be one of the hidden gems of the set. I like the idea of this turning into a Werebear as you use it. 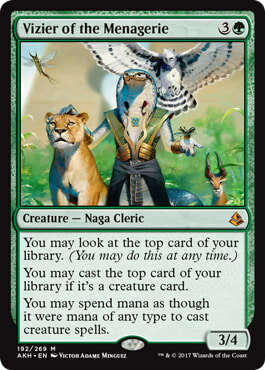 However, I think this is less exciting in Commander than Devoted Druid which is already being touted as part of an infinite combo and Gyre Sage, which grows much larger. 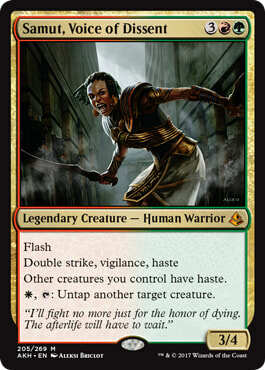 Combat Celebrant — Just find a way to blink this and give it haste and you can attack all day long. I’ve done similar things like attach Bear Umbra to Hellkite Charger. 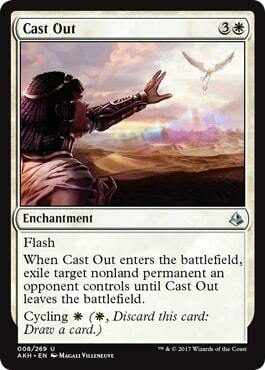 Maelstrom Wanderer, Narset and other aggro decks can make good use of this. I think this has a lot of potential future homes. Other spells may do it better, but sometimes we want creatures to do it for us in 75% decks. Cruel Reality — In general, this is probably a little too slow and/or expensive for Commander, but I think there are 75% decks which could make use of this. Picking on one player will make one player especially mad at you, so have a plan for that. Devoted Crop-Mate — I don’t know how, but I can really see this being part of some combo in the future. Until then, it’s a value-generator and that’s always welcome. There are plenty of broken cards in Commander with CMC two or less, especially in White. 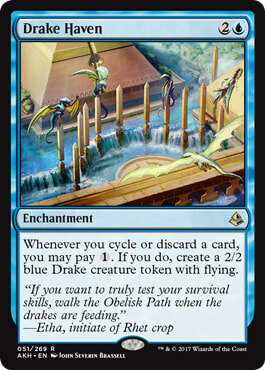 Drake Haven — I’m mostly excited about all of the alters with Drake sitting on the edge of the pyramid that are forthcoming. This makes drake tokens and people like doing that. It also mitigates them making you discard, so that’s also cool. This card will see play. 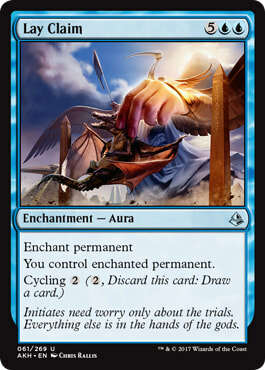 Faith of the Devoted — Not as Drakey as the other cards, but doming people with Wheel effects seems amazing. Yidris is ready for something like this, right? No one on EDHREC is using it yet, so maybe I’m off-base. Forsake the Worldly — I don’t hate this at all. 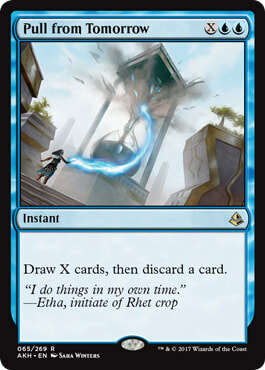 I have seen people play Revoke Existence, a card worse than this. This may even get the nod over Return to Dust if you benefit from cycling, somehow. All I’m saying is that this is better than cards that see play even if it’s not as good as better ones that see more play. I like this printing a lot. 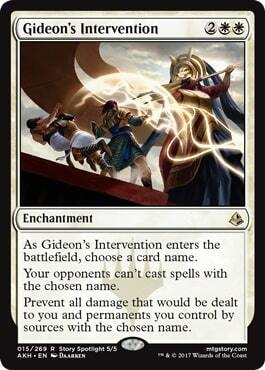 Gideon's Intervention — A better Nevermore that still does something if you cast it after the problem creature hits play? I like this a LOT. Glorious End — I sort of . . . hate this card. However, the number of lunatics who love doing the same wacky antics I love to do in 75% decks is too high for me to ignore this. Maybe you play a copy of this on multiple turns to prolong things, maybe you just keep someone else from winning but you lose, too, meaning someone else at the table wins, maybe this is all you need to stop another combo so you can untap and win. There is potential here, and I don’t ignore potential. 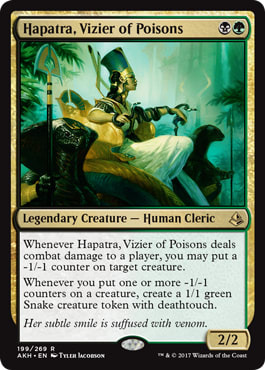 Hapatra, Vizier of Poisons — This is the most popular commander from Amonkhet on EDHREC and it’s not hard to see why. Harsh Mentor — There’s no way a hate bear doesn’t see some 75% inclusion. 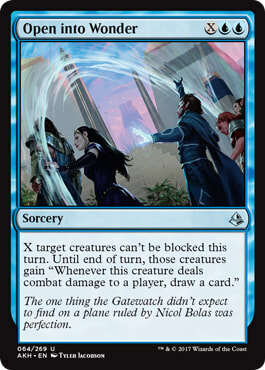 If Sensei's Divining Top doesn’t end up banned in Commander, you can at least punish their fiddling. This basically punishes people for making their turn take a long time, and I’m super OK with that, especially if I’m in the mood to play Red. 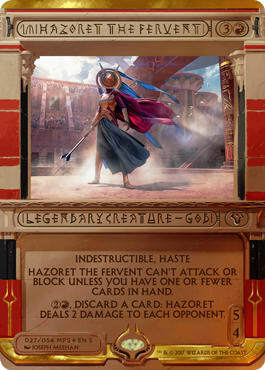 Hazoret the Fervent — Remember all of the jokes about how his name looked on the invocation card? This card is not as much of a joke since you can dome everyone for 2 repeatedly and even trigger stuff like Archfiend of Ifnir. This isn’t great, but it’s not unplayable. 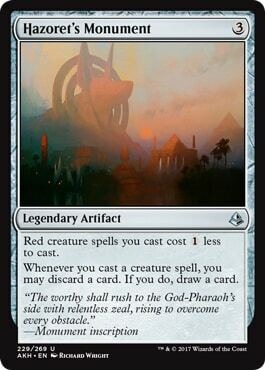 Let’s not burn boxes of Amonkhet because this isn’t Purphoros, God of the Forge. Hazoret's Monument — I have seen a lot of players excited about the Monuments and a lot of other players tell them that they are very wrong to like the monuments. They only reduce the cost for creatures, and that makes them bad. However, the triggered ability on this one makes it worth thinking about. Kefnet the Mindful — Everyone hates this guy. I realize he’s tough to get going, but I like him a lot with landfall. That’s probably durdly, but I like landfall a lot and if I’m getting an Admonition Angel trigger every turn, you’ll be impressed. If I’m getting a Roil Elemental trigger every turn, you’ll realize that Kefnet can be a great 75% card in the right circumstances. 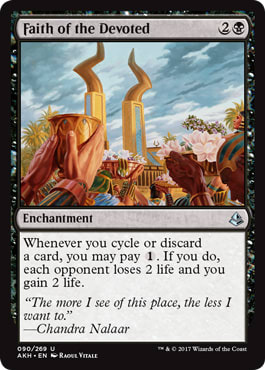 Lay Claim — In the same vein as other “This is just like a card I play and I’ll trade an extra mana for cycling” entries on this list, we have Confiscate, a card I’ll play, but it has cycling. I’m sold! 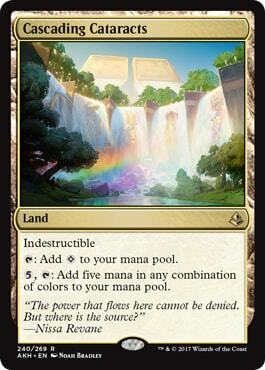 I may even take out Take Possession from my Maelstrom Wanderer deck for this since early all I want to do is play lands and mana rocks and I’ll let fate determine what I play once I start to cascade. Liliana's Mastery — This card was very good at the prerelease. I feel like in a dedicated Zombie deck, it’s going to be decent. More buffs for zombies are welcome and this gives us two shock troops to boot. Lord of the Accursed — Speaking of which, can we ever have too many Zombie lords? 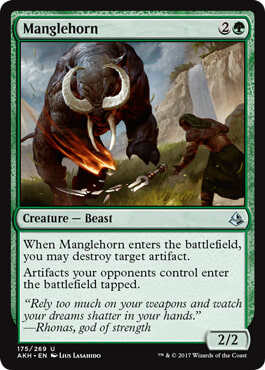 Manglehorn — I love this card. It doesn’t replace Acidic Slime, but it certainly thwarts some decks a lot better than Slime. This is such a good card. 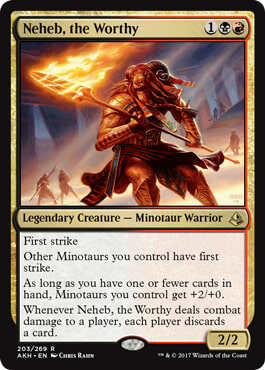 Neheb, the Worthy — This is not that bad a card. If you’re building a Minotaur tribal deck, clearly you don’t care if the deck is good or not. However, this is as good as the Werewolf commander people wanted should have been. This is a durdly tribal commander from a durdly tribe that is so good, I consider it a 75% card. Woah. Nest of Scarabs — Narrow but good. It bears mentioning. This was forecast to be slow and bad in Limited, but my deck was slow and bad and this demonstrated how powerful it could be if, you know, they failed to kill you in a game where you spotted them a whole turn playing this. Pair with cards like Crumbling Ashes and Blowfly Infestation. New Perspectives — I feel like the first sentence can be as powerful as the second. This is something I want to blink a lot, or maybe just cycle with a lot. Either way, when I built my cycling deck on this site, I regret excluding Blue. 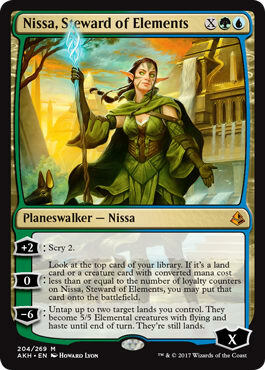 Nissa, Steward of Elements — This is probably good, right? You can play it for X= tons in Kruphix decks and then get free spells off the top all day. I like that idea. Open into Wonder — I like hitting them, I like drawing cards. I can’t decide if all of the decks where I want to do this are already hitting them unblockably and drawing cards or not. My feeling is that his can go in some decks. I really like the idea of hitting them with cards like Thada Adel, Acquisitor, you know me. 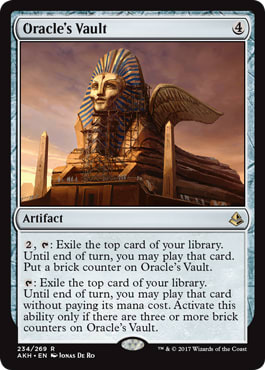 Oracle's Vault — Free spells are good. Pull from Tomorrow — A ton of cards already draw you a ton of cards like this, but this one makes you discard. If you can find a deck, like The Mimeoplasm, where that becomes “lets” you discard a card rather than “makes” you discard a card, you have a winner here. 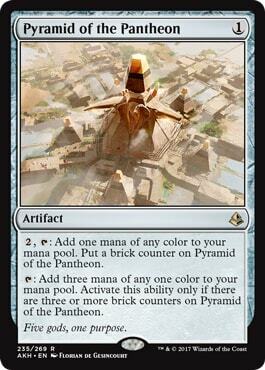 Pyramid of the Pantheon — I kind of like the idea of building a Gilded Lotus from scratch, but the mana fixing requirement to get bricks on this is really brutal, and if this gets blown up, you’ll feel rull bad. 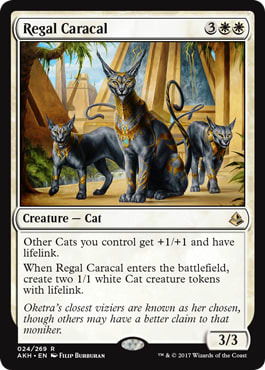 Regal Caracal — Reddit rejoice, there is another cat lord. 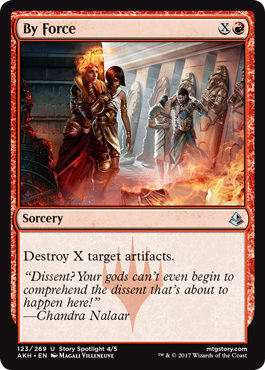 Samut, Voice of Dissent — This card seems like a mess to me, but enough people keep trying to build around it that I’ve got to acknowledge that this will see play. Maybe it will be Voltron, maybe some sort of . . . untapping cards like Rhys the Redeemed? I don’t know. I am watching this card closely to see how people build around it. Expect . . . something. 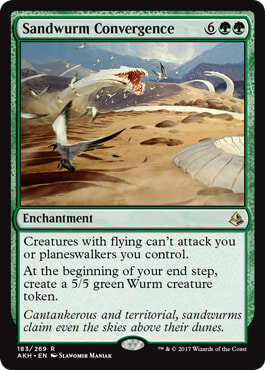 Sandwurm Convergence — This is a very, very Timmy card. Is it good enough for Commander? My Trostani deck wants to try. 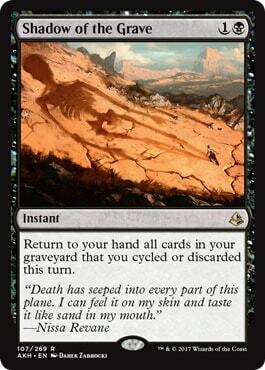 Shadow of the Grave — I’ve made so many jokes about how disgusting this is to play after you wheel in a deck like Yidris, Maelstrom Wielder that I can’t tell if I actually like this card or not. 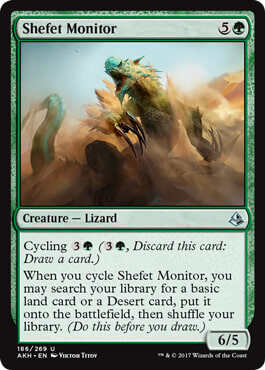 Shefet Monitor — I can see playing this as an Untamed Wilds that is also a cantrip and finding a way to make use of a big, dead lizard in your yard as an afterthought. 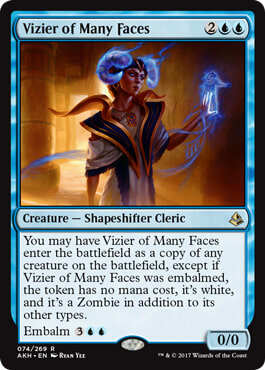 Vizier of Many Faces — I like the idea of a Clone you can bring back from the dead. Every set seems to give us a Clone . . . err, clone that has some upside. I think the cream will rise to the top but in the mean time, this seems like a front-runner to me. 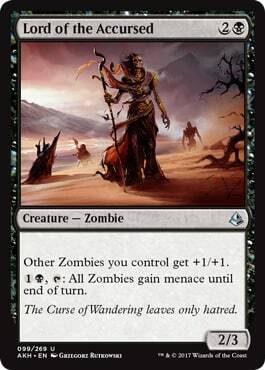 Vizier of Remedies — It doesn’t matter if this impacts Commander outside of making infinite mana with Devoted Druid, it does that and we need that in 75% decks. Vizier of the Menagerie — I’m not as high on this card as a lot of other people because I don’t think it’s being compared to the correct cards. This is not Oracle of Mul Daya. It’s more like Mul Daya Channelers if you ask me. Still a good card, but not going to take the format by storm. This is a Chromatic Lantern that makes your hand bigger by one card, sometimes. I don’t hate it, I just feel like we need perspective. If you like this card, wait a while, the price has some correcting to do. 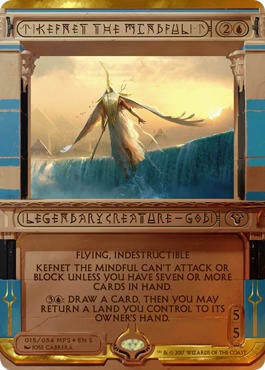 Weaver of Currents — This seems like a shoo-in for a lot of decks like Kydele, Chosen of Kruphix/Thrasios, Triton Hero and Kruphix, God of Horizons. I’m a sucker for easy mana in Simic. Hopefully there are some cards you hadn’t really considered playing that you might give a shot now. This is a pretty good set for Commander, and instead of repurposing cards that seem tailored for other formats, we seem to have quite a lot of cards that were made with Commander in mind. Give new cards a chance; you can always take them out later. I do know that Weaver of Currents, Anointed Procession and Manglehorn are already in decks and when I get more cards, more will follow. I hope everyone had a great prerelease weekend and I hope your brewing goes well with the new cards. Thanks for reading everyone, and we’ll be back next week with another deck. Got a suggestion? Leave it in the comments section. Until next week!